Computational fluid dynamic image of the Boeing X-43 at Mach 7 test condition. In aerodynamics, hypersonic speeds are speeds that are highly supersonic. Since the 1970s, the term has generally been used to refer to speeds equal to and greater than Mach 5, or five times the speed of sound. The hypersonic regime is a subset of the supersonic regime. Supersonic airflow is decidedly different from subsonic flow. Nearly everything about the way an aircraft flies changes dramatically as an aircraft accelerates to supersonic speeds. Even with this strong demarcation, there is still some debate as to the definition of "supersonic." One definition is that the aircraft, as a whole, is traveling at Mach 1 or greater. More technical definitions state that supersonic speed is achieved only if the airflow over the entire aircraft is supersonic, which occurs around Mach 1.2 on typical designs. The range Mach 0.75 to 1.2 is therefore considered transonic. Considering the problems with this simple definition, the precise Mach number at which a craft can be said to be fully hypersonic is even more elusive, especially since physical changes in the airflow (molecular dissociation, ionization) occur at quite different speeds. Generally, a combination of effects become important "as a whole" around Mach 5. The hypersonic regime is often defined as speeds where ramjets do not produce net thrust. This is a nebulous definition in itself, as there exists a proposed change to allow them to operate in the hypersonic regime (the Scramjet). As Mach numbers increase, the density behind the shock also increases, which corresponds to a decrease in volume behind the shock wave due to conservation of mass. Consequently, the shock layer, that volume between the body and the shock wave, is thin at high Mach numbers. A portion of the large kinetic energy associated with flow at high Mach numbers transforms into internal energy in the fluid due to viscous effects. The increase in internal energy is realized as an increase in temperature. Since the pressure gradient normal to the flow within a boundary layer is zero, the increase of temperature through the boundary layer coincides with a decrease in density. Thus, the boundary layer over the body grows and can often merge with the thin shock layer. High temperatures discussed previously as a manifestation of viscous dissipation cause non-equilibrium chemical flow properties such as dissociation and ionization of molecules resulting in convective and radiative heating. The hypersonic flow regime is characterized by a number of effects which are not found in typical aircraft operating at low subsonic Mach numbers. The effects depend strongly on the speed and type of vehicle under investigation. 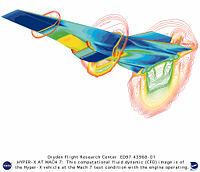 Hypersonic flows, however, require other similarity parameters. Firstly, the analytic equations for the Oblique shock angle become nearly independent of Mach number at high (~>10) Mach numbers. Secondly, the formation of strong shocks around aerodynamic bodies mean that the freestream Reynolds number is less useful as an estimate of the behavior of the boundary layer over a body (although it is still important). Finally, the increased temperature of hypersonic flows mean that real gas effects become important. For this reason, research in hypersonics is often referred to as aerothermodynamics, rather than aerodynamics. The introduction of real gas effects mean that more variables are required to describe the full state of a gas. Whereas a stationary gas can be described by three variables (pressure, temperature, adiabatic index), and a moving gas by four (velocity), a hot gas in chemical equilibrium also requires state equations for the chemical components of the gas, and a gas in nonequilibrium solves those state equations using time as an extra variable. This means that for a nonequilibrium flow, something between 10 and 100 variables may be required to describe the state of the gas at any given time. Additionally, rarefied hypersonic flows (usually defined as those with a Knudsen number above one) do not follow the Navier-Stokes equations. Hypersonic flows are typically categorized by their total energy, expressed as total enthalpy (MJ/kg), total pressure (kPa-MPa), stagnation pressure (kPa-MPa), stagnation temperature (K), or velocity (km/s). In this regime, multimolecular gases begin to dissociate as they come into contact with the bow shock generated by the body. The type of gas selected begins to have an effect on the flow. Surface catalycity plays a role in the calculation of surface heating, meaning that the selection of the surface material also begins to have an effect on the flow. The lower border of this regime is where the first component of a gas mixture begins to dissociate in the stagnation point of a flow (Nitrogen~2000 K). The upper border of this regime is where the effects of ionization start to have an effect on the flow. In this regime the ionized electron population of the stagnated flow becomes significant, and the electrons must be modeled separately. Often the electron temperature is handled separately from the temperature of the remaining gas components. This region occurs for freestream velocities around 10-12 km/s. Gases in this region are modeled as non-radiating plasmas. Optically thick: Where the radiation must be considered as a separate source of energy. Anderson, John David. 2006. Hypersonic and High-Temperature Gas Dynamics, 2nd edition. Reston, VA: American Institute of Aeronautics and Astronautics. ISBN 9781563477805. Jenkins, Dennis R., and Tony Landis. 2008. Hypersonic: The Story of the North American X-15. North Branch, MN: Specialty. ISBN 978-1580071314. Mikhailov, G. K., and V. Z. Parton. 1993. Super- and Hypersonic Aerodynamics and Heat Transfer. Boca Raton, FL: CRC Press. ISBN 0849393094. Murthy, T. K. S. 1991. Computational Methods in Hypersonic Aerodynamics. Southampton, UK: Computational Mechanics Publications. ISBN 0792316738. Welcome to the NASA's Guide to Hypersonics.